In this episode, I will walk you through the process of setting up a new Ubiquiti Node from scratch, and flashing it with the latest AREDN firmware. Then we will connect it to another node and look at the channel options on the firmware itself. When I click the OLSR status page from my node, I get redirected to port :1978 and the page is not found. I just get the browser page showing not found. Any thoughts? I'm on v1.0.0 of the firmware. Is there a reason why I don't see any mention of any wireless security methods/protocols? without having wifi security, anyone within range can get onto my network. 3.1 and if so... Where do I find it??? be able to expand the BBHN in places where using a Raspberry Pi could be advantageous. Getting started in Broadband Hamnet, previously known as HSMM-MESH networking for amateur radio. As amateur radio operators we have our own "Internet like" backbone, for emergency communications or for fun. It is very useful and can be deployed for a lot less money than you think. Check out this video to learn all about it and a future video sometime when I get it operational at my QTH. Today Darryl, K5DLQ, and I connect our MESH nodes together over an internet tunnel (this simulates a true over-the-air MESH network connection that isn’t possible due to the distance that Darryl and I are from each other) and connect our SharkRF Openspot devices together, then perform a short QSO. The SharkRF Openspot has been one of the most popular DV hotspots, allowing connection into the DMR, DSTAR and YSF networks. 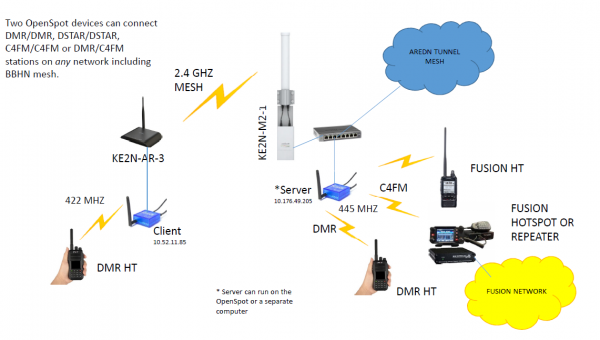 Today Darryl and I setup the SharkRF Server/Client option in the Openspot menu, then we use our DMR radios to communicate through each of our Openspot units (his being a server, and mine being a client which connects to his IP on the MESH network). This can be a great tool for using MESH networking to allow connection of non-MESH devices onto the network.